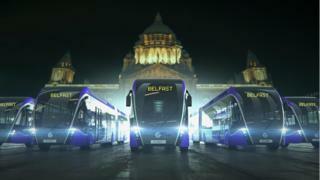 Like a tram on wheels - that's how the 'Glider' buses for Belfast city centre have been described. The buses have gone on display so the public can see what the new transport fleet will look like. The new fleet can be seen in Belfast's Custom House Square on Wednesday and Thursday between 11:00 GMT and 15:00. The Department of Infrastructure invested £90m in the rapid transit scheme. The service will operate approximately every seven to eight minutes and is set to go into operation by September 2018. Lord Mayor of Belfast Nuala McAllister said the new fleet was a "win-win" for the city. "The Glider service will encourage more people to use public transport which in turn helps ease congestion and improve air quality," she said. Ciarán de Búrca, from the Department of Infrastructure, said the rapid transit system was designed to encourage people to use their cars less. "It's a transport system that gives people the option to use public transport and this is part of the long-term sustainable future of the city," he said. Translink CEO Chris Conway said the new buses will transform public transport in Belfast. He said: "Helping to energise our city, the service will enable easy and convenient travel for more people to more places." Translink hope the new network will see a reduction in public transport journey times by 25%. The Glider buses will have Wi-Fi and USB charging hubs.